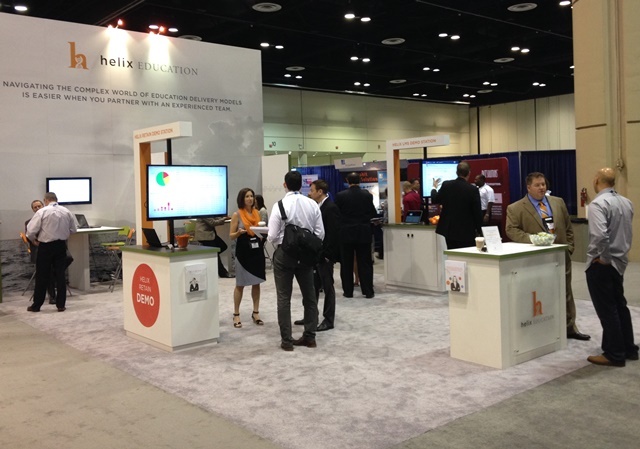 Our team has just come back from the EDUCAUSE Annual Conference, and what an invigorating few days it was. The event was abuzz with people talking about the future of education technology, and specifically an emerging market built on disruptive innovation, the importance of data analytics and the always popular notion of student success. One of the highlights of the conference was Clayton Christensen’s thought provoking keynote. A Harvard Professor, best-selling author, and recognized management guru, Christensen tackled disruptive innovation in higher education – what it means to embrace new models, why it’s important, and how to do in the most effective way. Student needs are evolving, and therefore schools need to embrace new and better ways to support them. Our team, and I imagine everyone in the room that day, left Christensen’s presentation more motivated and more energized about the future of ed tech. We had the exciting opportunity to unveil Helix Retain during the event, and it generated a ton of interest. Educators were impressed with the fact that Helix Retain automates so much of a school’s retention strategy through data aggregation and analysis, yet it allows coaches, mentors, advisors, and faculty the ability to personally act on data that is uniquely relevant to each student’s own needs, situation and preferences. Our sincerest thanks go out to EDUCAUSE and everyone who attended. We are so appreciative for the opportunity to collaborate and communicate with so many thought leaders in the space about disruptive innovation, data analytics, and student success (which by the way, are all pillars of our development efforts). If you thought we were excited about the future of education technology before, you should see us now! Leading the Partnerships Division at Helix Education, Kari brings more than 15 years of experience in higher education. In her role, she evaluates new partnerships, ensuring that the company and its clients are aligned for success. Kari has a Bachelor's degree in Public Relations from the University of North Dakota.